Many progressive communities are touting the benefits of “Road Diets”. Mobility managers looking to add parking while calming the swarms of autos buzzing through their cities and campuses may want to be aware of this approach to traffic management. No, Road Diets are not about traversing fast food drive-throughs in search of non-gluten, bean sprout, quinoa wraps. A Road Diet is a transportation planning technique that aims to reduce or rechannel traffic on roadways and create space for alternative forms of transportation, such as cycling, walking and public transit. A Road Diet is primarily achieved by eliminating traffic lanes or reducing their width. Road Diets can also eliminate – or create “new” – parking. 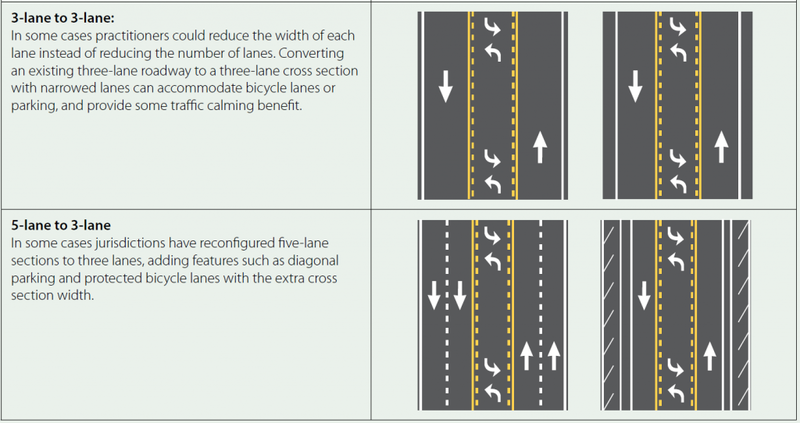 Image Credit: Excerpted from the “Road Diet Informational Guide,” produced by the U.S. Department of Transportation’s Federal Highway Administration. Relevant to our discussion here is what is done with the “new” space at curbside. In these cases, creation of bike lanes and/or diagonal on-street parking. 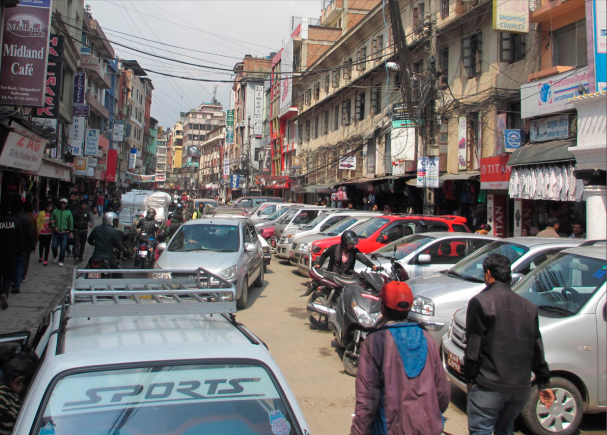 Cover image from “On Street Parking Management: An International Toolkit,” published by Deutsche Gesellschaft für Internationale Zusammenarbeit GmbH (GIZ) and the Sustainable Urban Transport Project (SUTP), and authored by Dr. Paul Barter (www.reinventingparking.org). This free and helpful new publication is available from our “Resources” page or from any of the above organizations including SUTP at https://tinyurl.com/jglwrqa. A more concentrated traffic stream may mean pedestrian crossings must be signalized. City Lab, makes a compelling case for Road Diets here, urging street parking be sacrificed for bike lanes. However, this affair is not all wine and roses as the “comments” section below the main article makes clear. While Road Diets apparently improve accessibility and may help reduce congestion, City Lab and many other similar analyses appear to overlook the impact of lost parking spaces on this equation. City Lab’s business case presents evidence that Road Diets more than pay for themselves, even noting cases in which curbside parking was eliminated as a result. City Lab presents evidence that eliminating traffic lanes and adding bike lanes in an area does not negatively impact local businesses. Apparently, at least in some cases, sales were actually up. Certainly, a community’s quality of life can be enhanced by this move, as it makes the area more pedestrian- and bike-friendly. Perhaps, in these particular projects, parking in the area was “free” at curbside (although Dr. Donald Shoup’s research at UCLA over the past several decades argues that there is no such thing as free parking). The loss of “paid” parking spaces on the other hand is a real loss to a minicipality’s revenue stream and does not appear to have been accounted for in the City Lab analysis. For example, the average revenue per parking space in Toronto, one of the cities mentioned as case studies, was approximately CND $2,050 (about USD $1,558) in 2005. With 168 spaces lost, according to the study quoted, decision makers must at least consider the impact of losing CDN $344,400 year after year. In some cases, these on-street parking revenues are dedicated toward community improvements. This is another of Dr. Shoup’s ideas that has been implemented in a few cities including Redwood, California. Reducing parking meter income dedicated to local improvements in these cases will certainly hurt the community even as new bike lanes enhance it. An off-street parking operator in the area might be well-pleased by the elimination of its on-street competition via a Road Diet, provided there was no disturbance of the parking facility’s curb cuts. This in theory might raise the actual cost of parking in the area. This is an idea which many experts, like Dr. Shoup support because it makes driving less attractive. However, many politicos are going to be unhappy to hear their constituents complain about not only the impact of the change itself, but this unintended consequence. The reverse argument can be made as well. Subjecting a roadway to a Road Diet and creating parking with the leftover space (in addition to bike lanes preferably) can help such renovations pay for themselves. It might actually lower prices in a community, which ironically might inhibit the development of alternative forms of transportation. Road Diets are not a panacea but neither are they a placebo. Enjoy in moderation.